EnergySage Archives - Solar Love! Home Tags Posts tagged with "EnergySage"
According to EnergySage’s recently released Solar Marketplace Intel report, the first in what is said to be a regular series for the solar price comparison service, some 90% of those who ask for quotes and then get solar installed are opting to buy their systems, not lease them. The report, which details the trends on residential and small-scale solar for the period of July 2014 through June 2015, looked at data on more than 10,000 quotes in the top 10 residential solar states. The company found that instead of solar leasing, which was once hailed as a renewable energy gamechanger (and which can still be an appropriate choice for some), customers are now either paying for their solar installations outright or taking out a loan for the costs. Although the data from EnergySage includes quite a few transactions, none of them include quotes or installations from SolarCity, the leading residential solar installer, which doesn’t participate in the program, so the trends noted on the report may differ a bit from a ‘real world’ perspective. Get the rest of the solar insights in the downloadable report at EnergySage. New figures from EnergySage show that solar installation costs in the US for the first half of 2015 averaged around $3.79 per watt. “The residential solar market is a vibrant $7 billion industry, and on track to generate more revenue by year-end 2016 than Major League Baseball,” said EnergySage CEO Vikram Aggarwal. “The economics of solar are rapidly changing for solar shoppers, installers, and financiers alike. As demonstrated by the data within our Solar Marketplace Intel Report, it’s becoming more affordable for US households to adopt solar. Solar is serving to meet 85% of solar homeowners’ electricity needs in 2015, with an average 7.9 per kilowatt system generating about $2,000 worth of electricity annually. 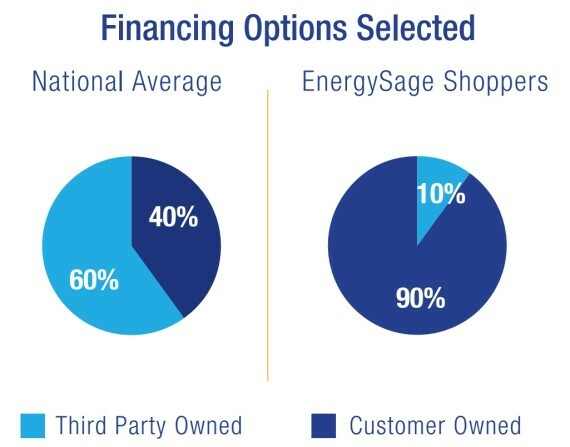 Interestingly, EnergySage found that 90% of solar shoppers using EnergySage’s Solar Marketplace elected to own their system outright from the get-go, rather than leasing it — choosing to either pay in cash or finance with a solar loan, rather than sign up for a third-party lease or Power Purchase Agreement (PPA). 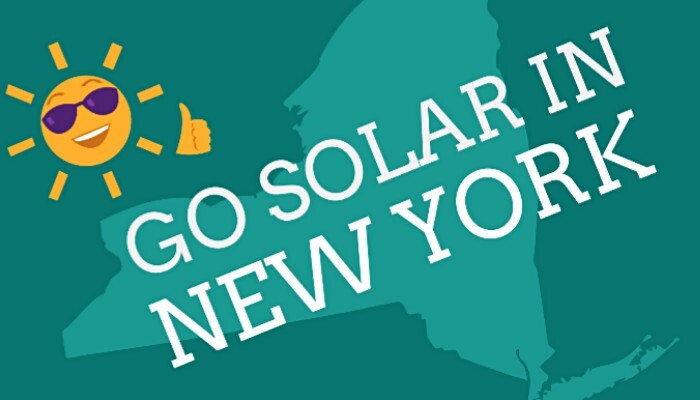 Promoting solar adoption in New York State, EnergySage has launched a local solar energy marketplace. Presenting consumers with unbiased facts, the new local solar marketplace will facilitate comparison shopping when researching financing options and installers, and hunting for the lowest price quotes. Consumers using EnergySage local solar marketplace services have been shown to adopt solar at rates two to three times higher than the industry average. 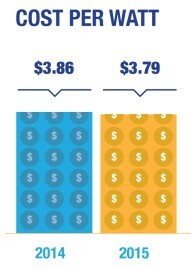 In addition, they pay prices that are estimated at up to 20% less than market averages. The national office supply chain Staples has partnered with a solar power shopping website to provide discounts on solar power to their customers. They are giving e-gift cards with values ranging from $125 to $2,500 to customers that install solar systems purchased through the partner, EnergySage Solar. So who is EnergySage? It is a new company that is made up of employees that care about the environment and helping people learn about solar power. 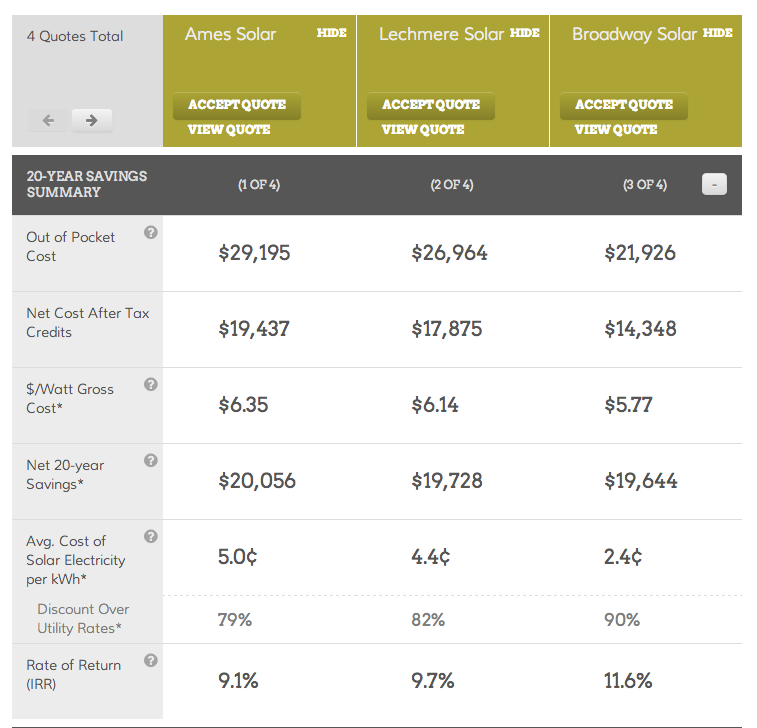 The site has a solar power system cost estimator. It only takes about one minute to get your cost estimate after you enter your physical address and then choose the residential, commercial, or non-profit option. Then you will wait very briefly and see the cost comparison of various solar power systems showing how much you will spend, how long it takes to pay off the system and how much money you will save. If you buy your own home pv system and stay in the say home for twenty years, you might save tens of thousands of dollars. The decision to choose solar power might be thought of as the right thing to do for the environment, but one that is expensive. However, the cost of home solar systems has decreased very much in the last six years. They are now more affordable than they have ever been, so some homeowners or businesses that get solar power systems will very likely save a lot of money over the life of the system, because they won’t have to pay a full utility bill for all those years. Another recent development is making home and business solar systems more attractive. Onsite energy storage in the form of batteries allows electricity generated by solar panels during daylight hours to be stored, so electricity can be used at night or on overcast days. These energy storage systems are in their infancy currently, at least for small solar systems, so they aren’t readily available at low prices. As more and more solar power systems are installed and there is increased demand for energy storage, they are likely to start entering the marketplace at appealing prices. Currently, only about one percent of electricity generated in the United States is produced by solar power, so we will see a lot of growth in this sector in the immediate future. Even now, we are witnessing a lot of growth, as we see with websites like EnergySage and partnerships with major retail chains like Staples. Going solar is now very easy, but it might be that many people are still thinking it is hard. Is Solar Leasing Your Worst Option For Going Solar? The $0-down loan ends up losing you money, while the lease saves you $12,000! 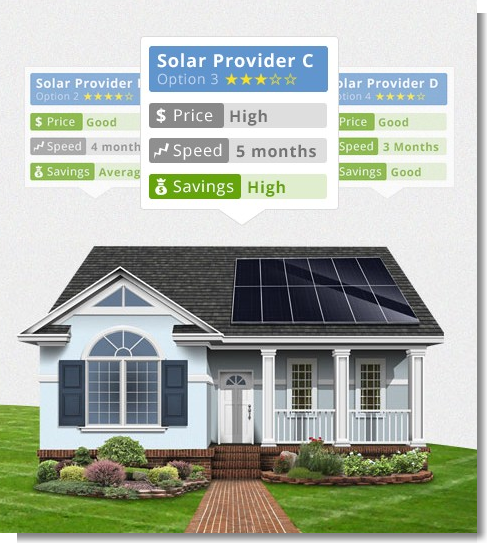 Instant Solar Estimate Tool Launched By EnergySage — Wicked Awesome! 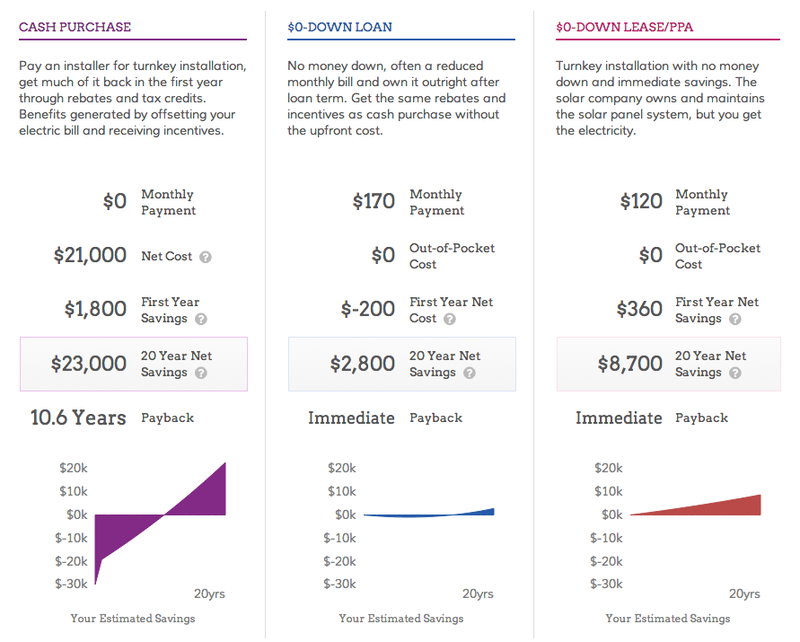 EnergySage this week launched a new “Instant Solar Estimate” tool. It’s wicked awesome! Definitely the coolest I’ve seen, and also the quickest. The report also provides a comparison between outright cash purchase of the estimated solar system vs getting the system through a $0-down solar loan (probably the Admirals Bank solar loan that’s available nationwide, but maybe EnergySage actually has a database of these for different banks and regions). In cases where a solar lease/PPA is available, the report also includes that in the comparison. 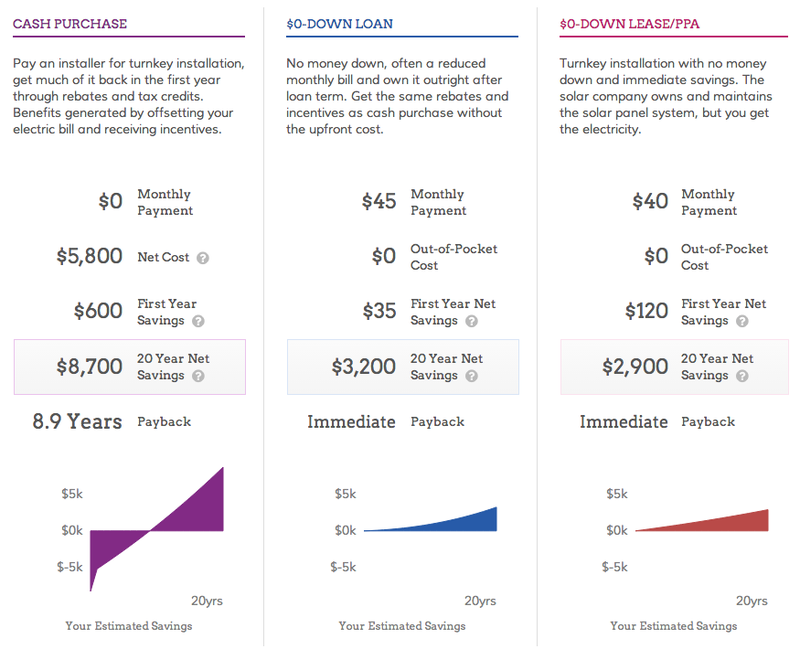 As you can see in the example above, sent along by someone at EnergySage (and quite different from my results for a home in Florida), the solar lease/PPA option fares much worse in the long term, while the upfront purchase fares the best in the long term but fares the worst (obviously) for the first 5 years or so. In my Florida test, my electric bill was much higher (thank you, air conditioning! 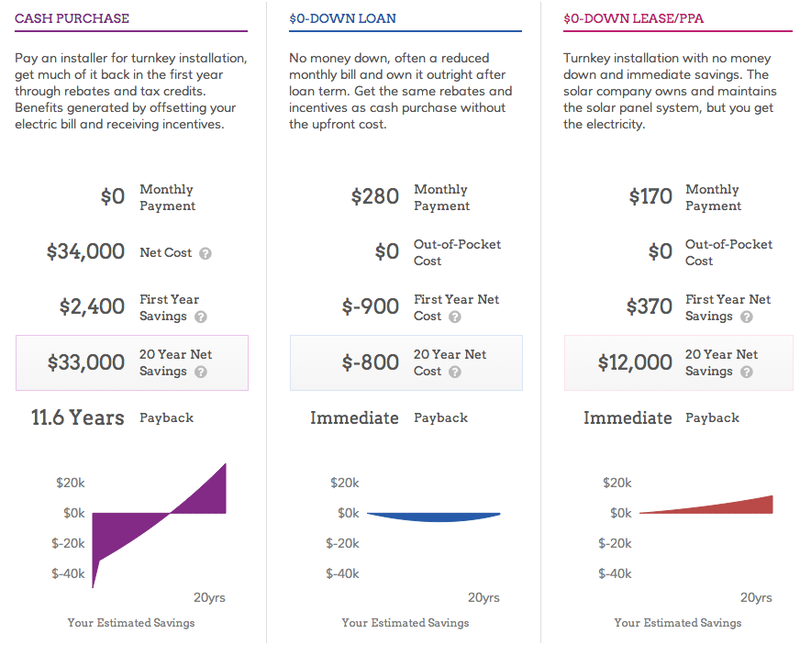 ); my monthly and long-term savings were greater; the $0-down loan option (on a ~$500 monthly electric bill estimate) actually ended up costing me more than if I didn’t buy the system; I had no solar leasing/PPA option; and my payback time was 13½ years rather than ~5 years with the upfront cash purchase option. I haven’t paid an electric bill in Florida for about 10 years, so I actually don’t have much of a clue what my bill would actually be today, so I ran the estimate twice, using both $300/month and $500/month. 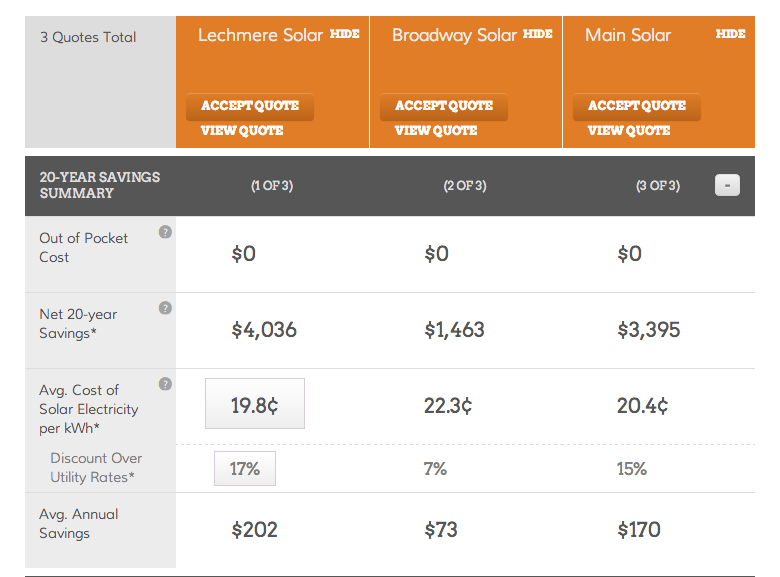 In the $300/month scenario, I didn’t have the $0-down solar loan option, just the cash purchase option. The estimated payback time was also 13½ years, but the 20-year savings were $35,000 rather than $58,000. But, anyway, my point here was just to show the variation possible. Go ahead and try out the tool yourself using your best estimates! In February, EnergySage, which has adopted the title of “the Expedia of solar power,” publicly launched its online comparison solar shopping site. I wrote a quick rundown of the website at the time. Luckily, not long after that, I got the chance to walk through the site and how it works with a member of EnergySage’s Corporate Development team. I got to see how the customers (residential, commercial, or nonprofit) navigate through the site, as well as how the installers do so. For various reasons (it’s a long story… or 5), I’m just now getting to writing about all of that and sharing it with you. Read on for the details…. The EnergySage system offers something for all different customer styles and preferences. 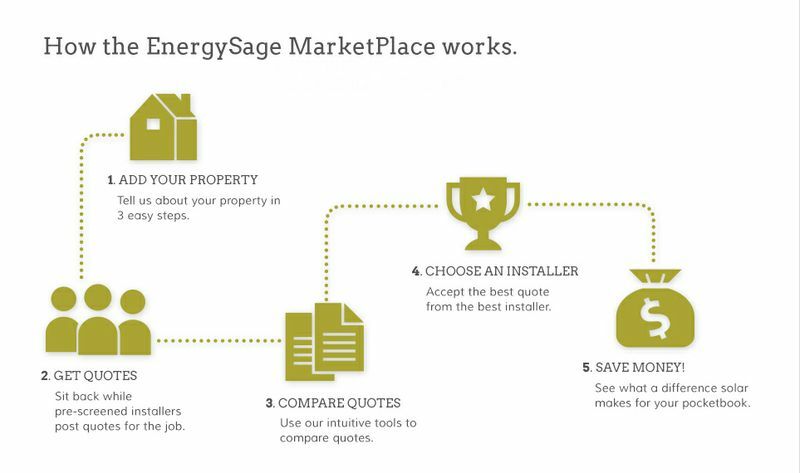 For customers who really want to dig in, EnergySage offers a wealth of information and comparison shopping support. However, if a customer wants to go through the process without much effort or thought, she or he also has that option available. 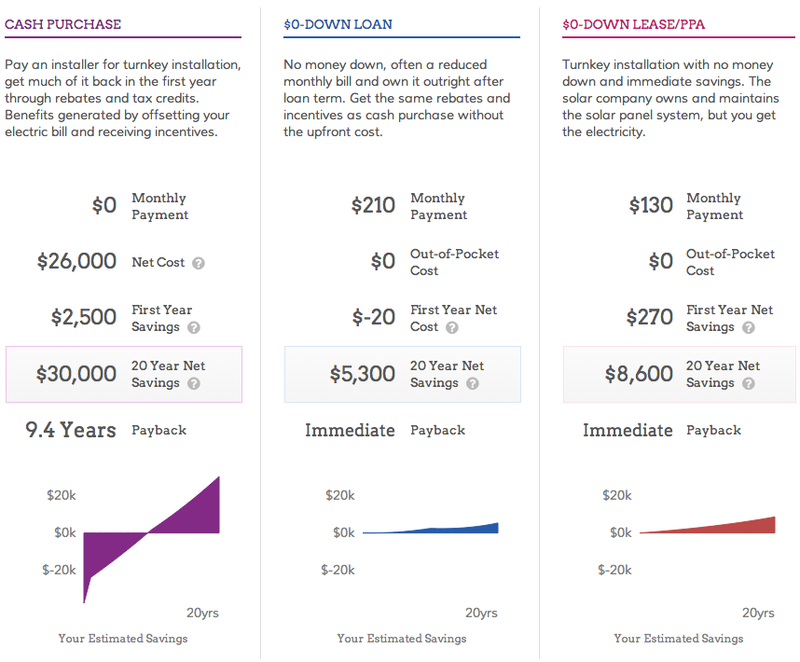 The process of installer competition is good for getting a better price, but it is also important to point out that EnergySage helps consumers evaluate installer and technology quality as well as some of the qualitative aspects of installer proposals — such as workmanship warranties, unique installation techniques, installer reputation and experience, and more. First, as with any site offering to get you solar quotes, you have to input a few details — basics like your address, details regarding your electric bill, how EnergySage can contact you, etc. This is normal and of course required if you are going to get any useful information about your unique solar possibilities. 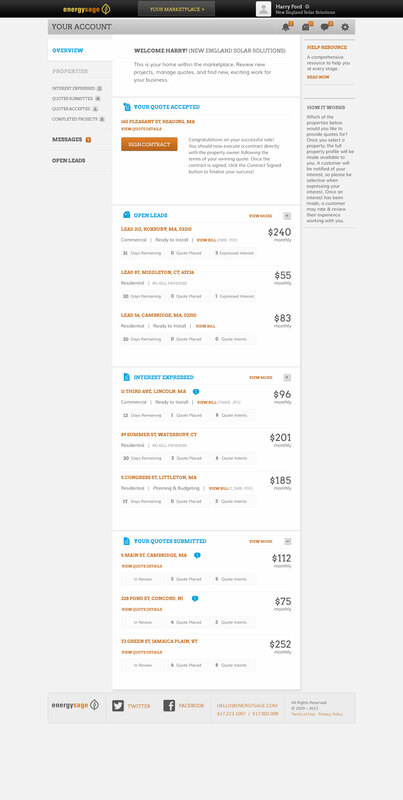 Once you (the consumer) receive some offers, you’ll have a dashboard something like this one below, from which you can compare quotes and communicate with installers. At this stage, and even more so as more quotes come in, you can learn much more about different solar power technologies, different financing options (e.g. purchasing the whole system yourself or leasing a system), different solar companies, and solar policies in your area. Again, this is where you have the option to learn as much or as little as you like (… I recommend learning as much as possible). It’s worth noting that EnergySage includes all existing financing options and pulls together all of these options in one place to give the consumer the full range of choices to select from. These options include cash purchases, leases, PPAs, solar loans, and all sorts of customized versions of these options. Below are two examples of the comparison screens for different types of quotes you might receive. 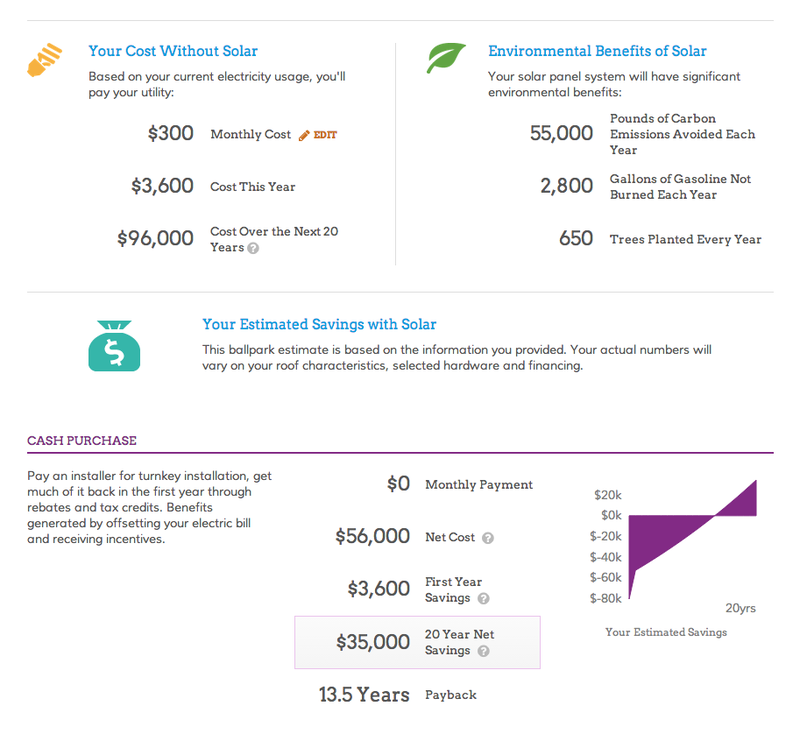 The first screenshot includes solar power system purchasing options, while the second includes solar power system leasing options. Also, note that, “behind the scenes, EnergySage performs a number of calculations that equalize the quotes (e.g. adjusting for differences in system size or the underlying assumptions used by the installers to determine financial benefits over the life of the system)” and that it also “calculates key decision metrics such as cent/kWh and gross cost per watt.” As John pointed out, such calculations “make it easy for customers to compare and evaluate the options presented.” Have a look below for the end result. 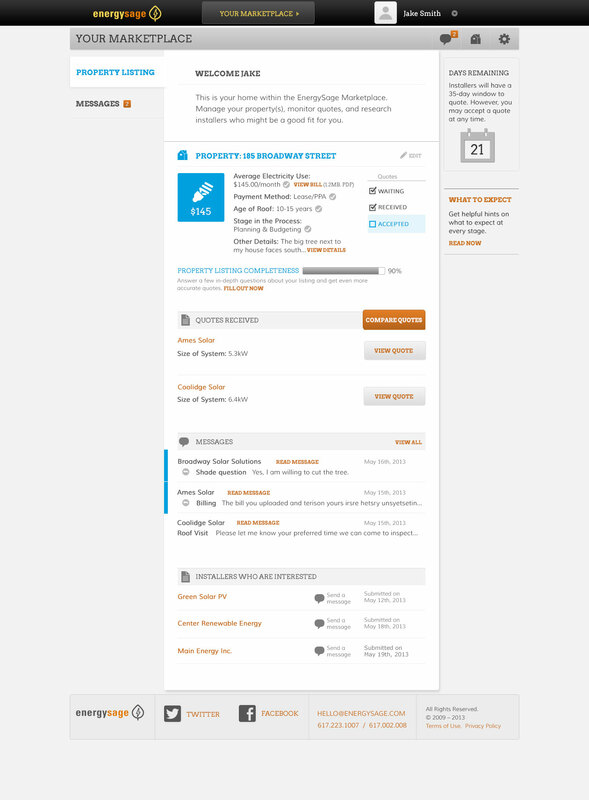 In February, I reported on EnergySage’s launch of the “Expedia of solar power,” a comparison shopping site aimed at getting customers multiple quotes for a solar power system on their homes or businesses. At the time, I wrote that 1BOG (with which we have a partnership*) offered essentially the same service. My understanding was that 1BOG got the best quotes they could from installers in the region and passed those on to customers. I got a bit of criticism in the comments because it EnergySage links people to multiple installers who compete for the project, while 1BOG seemed to just have partnerships with one installation company in each region (for example, hypothetically, SolarCity in the Bay Area), so it wasn’t stimulating competition between installers. I still think the comparison fit well (and I have since seen other leading solar reporters make the same comparison), because the overall purpose of both sites = make the solar power shopping experience simple and easy, and get customers the best quotes possible for a solar power system. However, that’s not to say one model isn’t a bit better than the other, and that EnergySage’s model might have generated more competition between installers, resulting in lower prices for residents. Following that post, I got a nice walkthrough of how EnergySage’s whole system works. I then reached out to 1BOG to get more details about its model so that I could write a post or two detailing the similarities and differences between the two companies. What I found out was that some big changes were coming to 1BOG’s system… and I needed to wait. Those big changes were just announced today. I’m still planning to write up one or two more in-depth pieces on EnergySage’s system and 1BOG’s system, but real quickly, I’ll go through what 1BOG is now offering and some ways it is similar to or different from what EnergySage is offering. Like with EnergySage, the customer can get a supporting hand from a 1BOG employee throughout the process. EnergySage, after a lot of anticipation, has officially launched its solar power online comparison shopping site (it actually allows for comparison shopping of some other energy technologies, too). The EnergySage Solar Marketplace should make shopping for solar faster, easier, and more convenient than ever.